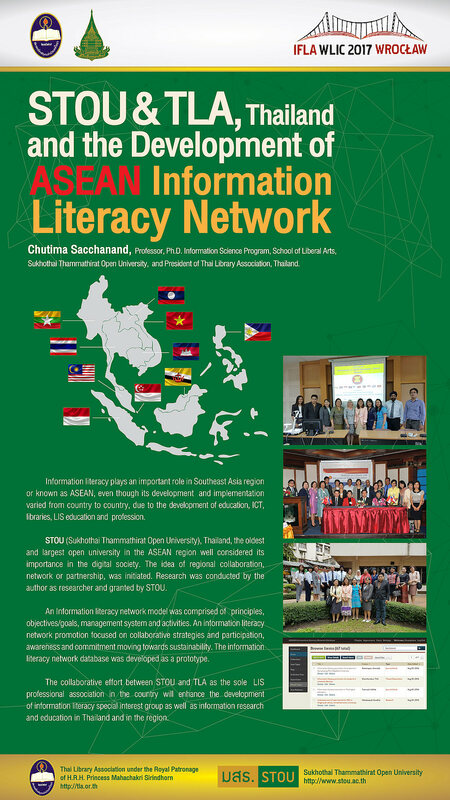 SACCHANAND, Chutima (2017) STOU, Thailand and the development of ASEAN Information Literacy Network. Paper presented at: IFLA WLIC 2017 – Wrocław, Poland – Libraries. Solidarity. Society. in Session 112 - Poster Sessions. Information literacy plays and important role in Southeast Asia region or known as ASEAN even though its development and implementation varied from country to country according to the development of the country , education, ICT , libraries and LIS education and profession. STOU ( Sukhothai Thammathirat Open University ), Thailand as the largest and oldest distance education university in ASEAN well considered its importance in the digital society. The idea of regional collaboration , network or partnership was initiated. Research was conducted and granted by STOU. ASEAN information literacy network model was proposed with the principles, objectives/goals, management system and strategies on collaborative participation, awareness and commitment moving towards sustainable ASEAN. 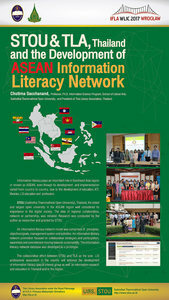 The database of ASEAN information literacy researchers and scholars was developed as a prototype.